The Isle of Mull is the second largest island of the Inner Hebrides, off the west coast of Scotland in the council area of Argyll and Bute. Mull is the fourth largest Scottish island and has an area of 338 square miles. The coastline of Mull is almost 300 miles long. The population of Mull, Iona and Ulva is around 1,800 people which is probably doubled in the summer because of the many tourists that visit Mull each year. 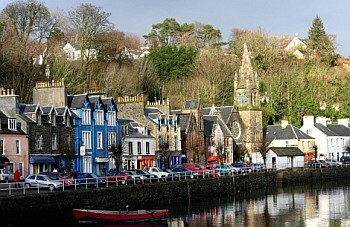 Much of the population lives in Tobermory, the only burgh on Mull until 1973, and its capital. Mull is surrounded by the Sound of Mull in the north, the Firth of Lorn in the south and east and the Atlantic Ocean in the west. Mull has been inhabited since around 6000 BC. Bronze Age inhabitants built menhirs, brochs and a stone circle. 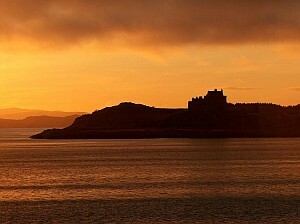 In the 14th century Mull became part of the Lordship of the Isles. After the collapse of the Lordship in 1493 the island was taken over by the clan MacLean, and in 1681 by the clan Campbell. During the Highland Clearances in the 18th and 19th centuries, the population fell from 10,000 to less than 4000. The island is home to over 250 different bird species including the White-tailed Eagle, which was reintroduced in the nearby Island of Rùm and migrated to Mull, where they now have a stronghold. Minke whales, porpoises and dolphins are among the sea life that can be seen on boat tours from Mull. Tobermory (meaning “Mary’s Well”) is the capital of the Isle of Mull. It is located in the northeastern part Mull, near the northern entrance of the Sound of Mull. Its population is approximately 700 people. The town was founded as a fishing port in 1788 on a layout designed by Dumfriesshire engineer Thomas Telford. Many buildings in Tobermory, mostly shops and restaurants, are painted in different bright colours, making it a popular location for television programmes, and gives the town a unique character. Important buildings in the town include Tobermory Clock Tower, a museum, the Tobermory Scotch whisky distillery, the Isle of Mull Brewery, and an arts centre. Ben More is the highest mountain and only Munro on the Isle of Mull. It is the highest peak in the Inner Hebrides outwith the Isle of Skye. The mountain is situated in the south of the island, above the shores of Loch na Keal. The peak is best reached from Loch na Keal, the walk following farm tracks, the side of a stream, and ultimately up scree slopes to the top. From the summit on a clear day, the view encompasses the Sound of Mull, Staffa, the Ross of Mull and Iona in the distance. From sea loch to summit is approximately a 4 hour walk. Standing on a clifftop guarding the Sound of Mull, Duart enjoys one of the most spectacular and unique positions on the West Coast of Scotland. Duart Castle has been the base of the Clan Maclean’s for over 400 years. In 1991 Sir Lachlan Maclean, the present Clan Chief engaged Professor Sir James Dunbar Naismith to repair the castle. The main repairs were completed in 1995, but work on the castle still continues. From 1st May to 2nd October: The castle, tea-room and shop are open daily from 10.30am – 5.30pm. Outside this period the castle and grounds have restrictions on opening hours, check before you visit! In 563 Saint Columba, exiled from his native Ireland, founded a monastery on Iona with 12 companions. From Iona they set about the conversion of pagan Scotland and much of northern England to Christianity. Iona’s fame as a place of learning and Christian mission spread throughout Europe. Iona became a holy island where several kings of Scotland, Ireland and Norway came to be buried. Notable burials on Iona include: King Donald II of Scotland, King Malcolm I of Scotland, King Duncan I of Scotland, King Macbeth of Scotland and King Donald III of Scotland. Many believe that the Book of Kells was produced, in whole or in part, on Iona towards the end of the 8th century. In 1773 Iona was also visited by Samuel Johnson and James Boswell during their famous Tour of the Western Islands. Both Johnson and Boswell wrote famous travelogues of their journey. Iona has been a place of pilgrimage for 1500 years, and today some 140,000 people make their way here each year. Iona itself is three miles long and a mile and a half long. Iona can be reached by ferry from Fionnphort on Mull and will bring the visitor to Baile Mor which means Big Town. Iona differs much from Mull, there are no tall mountains but instead there are some lovely white beaches. Interesting sites on Iona are Iona Abbey which is home to the St John’s Cross in the Abbey museum, Iona Nunnery, St. Martins Cross and several other Celtic Crosses. The Isle of Mull Railway is Scotland’s only island passenger railway. The railway is 1¼ miles long and operates steam and diesel hauled trains to Torosay, where you can visit Torosay Castle and 12 acres of prize-winning gardens and woodland walks. There is also a footpath from Torosay to Duart Castle (about 3 miles), ancestral home of the Clan MacLean. This famous, very small old distillery, the only one on the island of Mull, reopened in 1990 after being mothballed for 10 years. It has continued to market two products – a malt and a blend. The former, identified as Tobermory the Malt Scotch Whisky is presented in a bottle with an enamelled label. The whisky from this distillery is classified as an Highland whisky. The current owner is Burn Stewart. The distillery is open for visits from Easter – Oct: Mon – Fri 10am – 5pm and from Oct – Easter: By appointment. Staffa lies about 6 miles from the nearest point of Mull, and 9 km northeast of Iona. Staffa is a small island and measure not even a mile long and a half mile wide, its highest point is 42 m (135 ft) above sea level. During the tourist season it is visited every weekday by boats from Oban and from Fionnphortand allow visitors to view the migratory puffins that settle on the island in the summer months, between May and September. 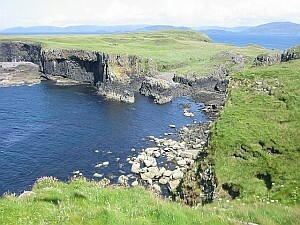 Staffa is now owned by the National Trust for Scotland. Ulva is a privately owned island off the west coast of Mull. Until the mid-nineteenth century its main industry was kelp collection and export. A church on the island designed by Thomas Telford dates from this period. The island has a population of sixteen people and is known for its wildlife, which includes deer, buzzards, golden eagles and sea eagles. The Treshnish Isles are an archipelago of small islands and skerries off the south-west coast of Mull. They are thus part of the Inner Hebrides. From north to south, the larger islands include: Cairn na Burgh Beag, Cairn na Burgh More, Fladda, Sgeir an Eirionnaich, Sgeir a’ Chaisteil, Lunga, Bac Mór (also known as Dutchman’s Cap due to its shape) and Bac Beag. The islands are uninhabited and are owned by a charity, The Hebridean Trust. The Treshnish Isles are designated a Site of Special Scientific Interest and a Special Protection Area due to their importance for breeding seabirds. They are also known for their Atlantic Grey Seals and ruined castles.